Rain Man Roofing provides residential services whether you need a re-roof, repair or maintenance to your tile, shingle, flat roof and walk deck needs. At Rainman Roofing, we're familiar with every type of commercial roofing installation system. All jobs are done to 100% satisfaction. Waterproofing can be costly to any home or business. Rain Man Roofing can install or repair all types of Waterproofing issues. Hiring a Rain Man Roofing expert to do repairs on your home or business is an important decision. 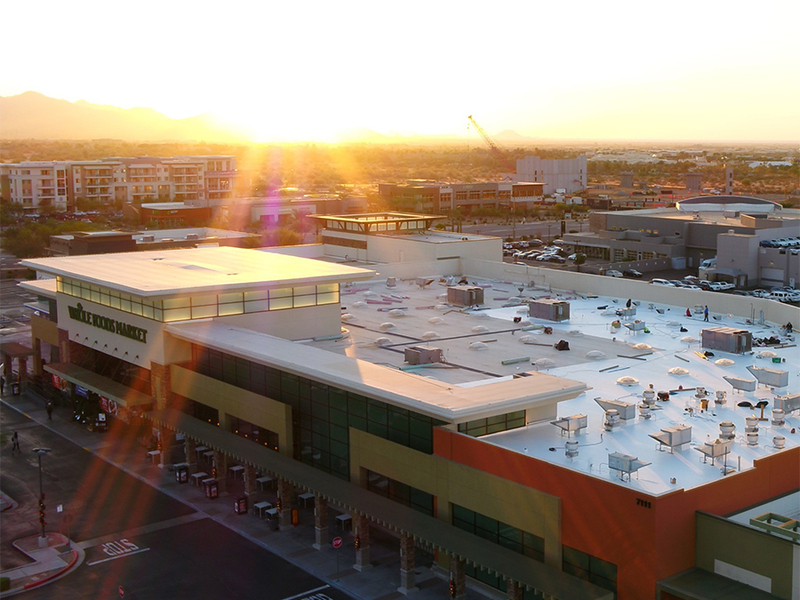 An Arizona BBB Accredited Business since 2011 with an A+ rating, Rain Man Roofing is one of the most highly rated Arizona and California Roofing Specialists. Headquartered in Anthem, Arizona. Rain Man Roofing has over 25 years of unmatched expertise in commercial and residential roofing solutions. Every Rain Man Roofing solution is inspected at the start and end of the job. We provide pictures and a report to our clients so they see the unmatched quality of work that was completed. Rain Man Roofing has earned quality ratings in residential and commercial roofing. We deliver roofing services and solutions that go above and beyond the standards in the roofing industry. If your roof is in need of repair, Rain Man Roofing can provide you with a quality solution. A solution that exceeds the needs in both the Arizona roofing and California roofing industry. Look no further than the professionals at Rain Man Roofing and Waterproofing Services Inc.
A low sloped flat roof is a roof which is almost level in contrast to the many types of sloped roofs. The slope of a roof is properly known as its pitch and flat roofs have up to approximately 10°. Walk decks are a flat surfaced area on the roof or side of a building intended for foot traffic. Their structure is generally wood or concrete based. Many homeowners have walk deck areas to enjoy the surrounding scenery. These commercial roofing membranes are flexible sheets of compounded synthetic materials that are manufactured in a factory to strict quality control requirements. Single ply roof systems provide strength, flexibility, and long-lasting durability. Spray Polyurethane Foam, commonly referred to as SPF, is an insulating plastic that is sprayed on as a liquid that quickly expands to several times its original thickness creating a water tight roofing material. If your roof is old, wearing down, leaking, losing energy, getting too hot, or failing in any way that is not structural, silicone restoration coatings can help you.